Getty's Tim Potts says the way to deal with antiquity smuggling is to "educate" the Ignorant Darkies of the Source Countries to stop them "allowing" this to happen. He should tell that to the farmers of Siwa Oasis in Egypt. There smuggling has reportedly been going on under the noses of the authorities, who seemed unconcerned unless it involved drugs or weapons. Yesterday the locals ("parents and religious leaders") were planing to organize a protest meeting outside the police checkpoint. At three in the afternoon about 50 people had gathered and stood there waiting for the rest of the residents and the elders of the oasis to arrive. The meeting never took place, the assembly learnt of the outbreak of a small fire in the fields. 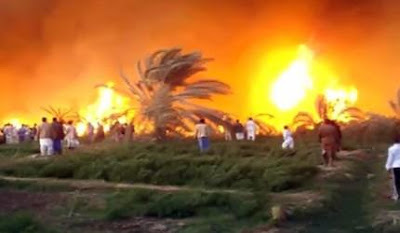 The wind helped it to spread aggressively, and the farmers were busy fighting the resulting conflagration into the middle of the night. Many hectares of arable land with standing crops were ruined, farms were burnt. It seemed the smugglers wanted to send the villagers a message concerning what would happen if they tried to stop them. In this case the main commodity passing through the oasis near the Libyan border is cigarettes, but other goods probably travel with them. Smugglers are criminals. Very often the organized criminal groups behind this trade act in various ways - including the ruthless use of violence - to ensure that the officials who should be vigilant at the borders 'look the other way' and nobody interferes. People who buy smuggled goods of any kind, antiquities included, are dealing with criminals. Dealers who sell artefacts which were smuggled out of source countries may mislead their clients into thinking the artefacts are "rescued" from the Oriental "ignorance" and "corruption" of the "Natives". They are instead selling the proceeds of a criminal activity, often knowingly - for how can it be otherwise? The people of Siwa do not need the Getty or Dr Potts "educating" them. They need help fighting the criminals. Among other things, the concerned citizens of the plundered antiquities source countries need collectors and institutions to exercise more discretion and STOP the n0-questions-asked trade in dodgy antiquities. The absence of information should not confer the benefits of a good faith purchase. Sotheby's argues the burden should be placed on Cambodia. I wonder though if the blunt reality of two feet without a body might lead a thinking person to a different conclusion. Indeed, the question is to what degree collectors of knocked-off ('portablised') statuary and the suchlike are what most of the rest of us would consider 'thinking persons'. It seems to me that no-questions-asked collecting is a particularly thoughtless pastime. "Sold by Spinks, no Paperwork" eh? In my post about the statue from Koh Ker, Cambodia, mention was made of the "surfacing" of a statue removed from the site and the country at some time in the 1970s (it seems). An attempt was made by a "noble European woman" to sell it at Sotheby's but the items was spotted as having been taken from Koh Ker and the sale suspended. Sotheby’s says that the seller is a “noble European lady” who acquired it in 1975. Although it was severed from its feet and pedestal, which were left behind at a remote Cambodian archaeological site, Sotheby’s says there is no proof that it was taken illegally. They say that their pre-sales research proved that its unnamed client has had “clear title” to the work since buying it from Spink & Son in London in December 1975. Most inconveniently, or perhaps conveniently, a spokeswoman for Spink said the 1975 records about where the company had obtained the statue were no longer available. Now Spink's is more generally associated with the sale of dugup and other coins, nevertheless the same year as the Khmer Rouge began their reign of terror and destruction, this broken-off statue had already surfaced on the London market. Spink's bought it, goodness knows why and goodness knows how they thought it had come onto the market, they've not kept any paperwork that would allow that question to be answered. Spink's might be thought to have an aversion to paperwork. It was Spink's that sold the ACCG some Chinese and Cypriot coins in 2007 and not only exported them to the USA without the paperwork required by the CCPIA (which Spink's should have been aware of) but also failed to supply it in the ninety days allowed by US law to allow such documentary lacks to be dealt with. Maritime "Carriage of Coinage Laws"? Wassat, then? The endearing characteristic of US Coiney lawyerism is its ability to surprise. Washington lawyer Peter Tompa has a post admonishing that the "archaeologists" are wrong to have "pitched Spain's win in the Odyssey Marine Case as win for archaeology over the commercial exploitation of shipwrecks" (as if they all did, I wrote all the time of salvage law). This is because of some "carriage of coinage rules" (sic), because "the decision was in fact narrowly based on the fact that a Spanish warship carried the treasure, i.e., archaeological arguments were not result determinative". Ummm, duh. Yes, that is what the case was about, whether the state of Spain had abandoned the property. No, it had not, so Odyssey had no right taking other people's property off a Spanish warship and apparently hope they could bluff their way through the US court system and keep it. It seems OMEX has learnt its lesson and (rightly or wrongly from the preservation point of view) has entered a "partnership" with the British government over the Sussex and Victory. The British government seem fond of entering "partnerships" with Treasure hunters. The British government has not abandoned its property in the form of the ships and what they had on board, but Odyssey will be removing the latter with permission. Not like they did when they found the Nuestra Senora de las Mercedes. So, maybe Mr Tompa would like to explain what these "carriage of coinage" laws consist of, and how they differ from the Law of the Sea on salvage. This is an offshoot of an earlier project of hers to create a database of looted objects. Readers may remember that I explained at some length some months ago why I was a bit critical of the original exceedingly ambitious idea. This version is far more modest and, I think, far less controversial, and through that - more useful. The name is deliberately catchy, and the presentation is kept very minimalist and basic. The idea is for images to be freely available for all to see so that the objects they depict can be returned to the rightful owners. "That is the only agenda I have" she is careful to point out. "I went for this very simple web site that people can browse to get around any controversies". At the moment there are relatively few groups of objects included on the database, but Dr King promises to keep adding to it. There is a web resource for antiquity collectors called Fakebusters which has been going since 2005, but concentrates mainly on ancient Egyptian artefact types. 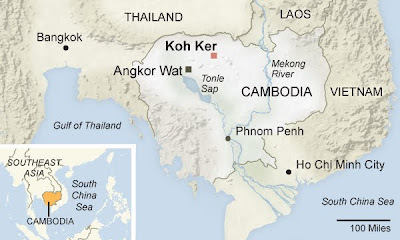 In Cambodia, in a place known as Koh Ker, 60 miles northeast of the Angkor Wat complex, lies another large important urban site. In one of the temples, dating from the mid-900s (thus about 200 years older than the famous sculptures at Angkor Wat) there were a pair of sandstone statues depicting scowling athlete-combatants in intricate headdresses positioned in battle-ready stances flanking one of the entrances. The pair of sculptures ('five feet tall and weighing 250 pounds'), were still in position in old photos of the temple. The site however was one of those plundered in the 1970s amid the chaos of power struggle and genocide, when the Khmer Rouge ravaged Cambodia from 1975 to 1979. Looters hacked their way into long-inaccessible temples, pillaged priceless antiquities and sold them to Thai and Western collectors. In 2007 archaeologist Eric Bourdonneau located one of the Koh Ker statues as being on display since 1980 at the Norton Simon Museum in Pasadena, California. The lower portion matches perfectly the pedestal from which it had been detached and which still stands in situ on the site. Norton Simon, an industrialist and collector, reportedly bought this statue in 1975 from a leading Madison Avenue antiquities dealer, William H. Wolff. Now there is controversy about the other one, offered for sale last year at Sotheby's with a catalog estimate of $2 million to $3 million. The item was withdrawn on the day it was to be sold, March 24, 2011, after a Cambodian official working with the United Nations stated “that this statue was illegally removed from the site”, “illegally removed” from the country and asked Sotheby’s to “facilitate its return.” The Cambodian government also contacted the State Department, prompting an ongoing investigation by the Department of Homeland Security’s Immigration and Customs Enforcement branch. 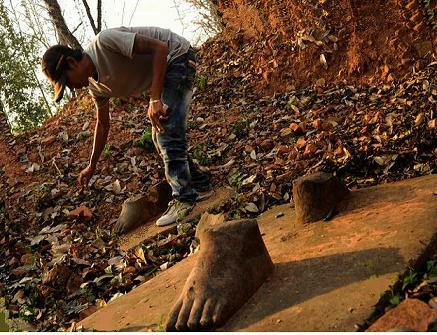 Archaeologists and Cambodian officials say the case of the footless statue is all the more poignant because of the country’s recent history of genocide and plunder, and because researchers have found the very pedestal and feet belonging to the artwork. Tess Davis, executive director of the Lawyers’ Committee for Cultural Heritage Preservation and the Cambodia scholar who dug out the law, said it had been analyzed by three French-speaking lawyers conversant in cultural heritage litigation and by [Anne] LeMaistre[, the Unesco representative in Phnom Penh]. 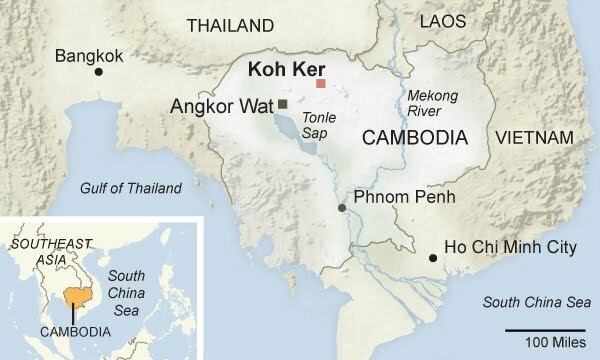 All four say it “nationalizes ownership of Cambodian cultural artifacts.” If international legal authorities and American civil courts agree, the law could establish 1925, rather than 1993, as the dividing point after which Cambodian artifacts taken without government permits can be treated as stolen property. 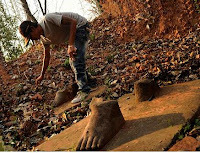 Cambodia would still have to prove that the statue was looted after 1925. Archaeologist Eric Bourdonneau says the relics were looted in the early 1970s. He said French records in Paris indicate that the statues were in place in 1939, and that the Koh Ker temple was thickly covered by jungle and inaccessible by road until it became a military staging area for Khmer Rouge and Vietnamese forces. I must say, journalists Mashberg and Blumenthal do not seem very sympathetic to Ms Levine's position. Vignette, two trunkless legs of stone alone in the jungle stand (after Agnes Dherbeys, The New York Times), map by New York Times. The American "collectors' rights" lobbyists are always moaning about how loathe those foreign nations are to loan them objects (which they say are their "right" under the US-drafted CCPIA). Yet what happens when they do? We saw an Italian painting seized from a Florida museum which is not going back to Italy. Ancient artefacts loaned and being studied in Chicago were the subject of a court case by people who wanted to get their hands on them and sell them off as assets of the Iranian state. Yale University dragged its feet over giving back material from Machu Picchu loaned decades ago for study. Now the Polish press are up in arms. Auschwitz-Birkenau is a protected site, it is a World Heritage Site, and yet out of the goodness of the heart of the Polish people we lent the Holocaust Museum in Washington half a barrack building from Birkenau. It was a ten year loan in 1989. That loan was renewed for another ten years, so they've had it twenty years. The loan expired in 2009. Now it is time for it to come home. Guess what? The Americans don't want to give it back. Piotr Cywiński, the Director of the State Museum of Auschwitz-Birkenau has asked for it back. According to the Polish newspaper Rzeczpospolita, Washington has stopped answering letters on the subject, and is trying to engage the US Jewish community to put pressure on the Poles to let it stay. According to the newspapers, they are using all sorts of arguments. the object is "too fragile to travel" (what, it has been in the care of a US museum a mere two decades and is now in a worse state than when it arrived there?). W gazetach pojawiły się zaś sugestie, że Polacy jako współodpowiedzialni za Holocaust nie zasługują na to, aby opiekować się obiektem. ["in the newspapers - ie the American ones - the suggestion has been made that since the Poles were co-responsible for the Holocaust they do not deserve to look after this object"] In that vein, we could add that as a hotbed of Holocaust Denial, the US certainly is not. The segment in Washington is half a prefabricated barrack block from Birkenau, the other half remains on the site. "We have indicated many times that this half of the barracks must return, that there is no other solution in accordance with the law," Cywinski said. "It's a very important object, not just for Washington but for the integrity of Birkenau, the last authentic site of Holocaust remembrance among all the major death camps." 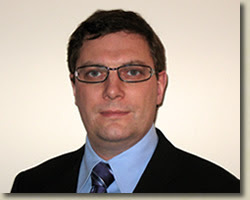 [...] The fate of Cywinski, the Auschwitz museum director, is at stake in the matter. Under the law on protecting historic artifacts, he could be jailed for up to two years if he fails to obtain the return of any object on loan. The Polish law is designed to make sure that nobody has any leeway in allowing Polish artefacts to leave the country permanently Poland is trying to protect the artefacts in its care, all of them. Of course nobody here has anything whatsoever against Americans getting on a plane and coming to see the whole Birkenau complex, not just the portable antiquity that they've made of just one tiny bit of it. After all, is that not precisely what they want all the citizens of other nations to do to see the bits and pieces collected in US "universal" (encyclopaedic) museums? Poland was home to Europe's largest Jewish community of some 3.2 million before World War Two, but most of them died under the Nazi occupation. 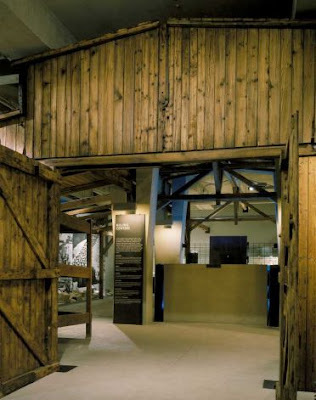 The Auschwitz-Birkenau open-air museum covers more than 200 hectares (500 acres) and 155 buildings, including the gas chambers, 300 ruined facilities and hundreds of thousands of personal items. Members of my family and the families of several people I know died in Auschwitz-Birkenau. They were not Jews. America, give back what does not belong to you, please. Vanessa Gera, 'Poland, U.S. tussle over Auschwitz barrack on loan', Washingtom Times', 26th February 2012. Vignette: Washington Holocaust Disneyland: A ten year LOAN from Poland, the Americans want to keep it. How many Objects are PAS "Finders" Finding and Keeping? It is interesting to look through the PAS statistics for the self-recording finders. There is an inherent probability that many of them are collectors with collections (and the knowledge about the items) so the figures of items recorded in a year will give an idea about the accumulation of objects. Obviously not all of the finds recorded on the PAS database in 2011 by Finder X will have been found in 2011, some of these people may be dealing with backlogs going back several years of non-reported finds. Likewise those who record just one or two may have many more objects at home, but they were just trying out the system (or boosting 'recorders' statistics for the PAS). Nevertheless these figures provide quite an interesting contrast with the figures for reporting of finds for 2011, where statistically one detectorist in England and Wales corresponds to just under eight finds in the PAS database, when it is clear that many will find this many recordable finds in a single weekend. So, what is happening to the rest? English Heritage: "Jolly Good Thing this metal detecting"
Bob Preece, Yorkshire Post's Crime Correspondent, notes that Yorkshire’s heritage is being ruined by "opportunist metal thieves" and shameless graffiti vandals: "They are ruining historic sites for everybody and depriving historians of the chance to learn more about the region’s past". British police, despite costly special training to investigate heritage crime, cannot cope and call on volunteers to help them monitor monuments for signs of damage and graffiti. With the aim of raising such vigilantes, a conference was held in York over the weekend hosted by English Heritage, together with the city’s council and archaeological trust. English Heritage expert Pete Wilson said “nighthawks” had long been suspected of destroying valuable archaeological evidence at Iron Age sites in the Yorkshire Wolds. 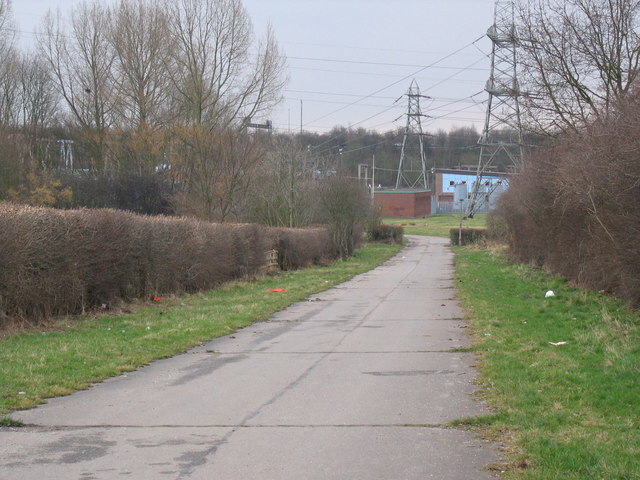 Sites near the old Roman road Dere Street, running through the Vales of York and Mowbray, are also thought to have been targeted. “There are stories of sites of archaeological interest being targeted to order,” Dr Wilson said. “There are signs of a network of metal detectorists being commissioned to go to Iron Age sites that might have swords or armour. “The challenge is that, even if you can catch somebody and get them arrested, then get them convicted, the site is still there and potentially vulnerable to other people doing the same. “It is impossible to say how many nighthawks there are and it is an unfortunate term because some do their looting during the day". I'll come back to that ACCG-like notion of looters "contributing so much" to knowledge by depleting the archaeological record. Let's look at the numbers he gives first . Well, according to the PAS database in the past year " Quantities of objects and records found Date from: 2011-02-27 Date to: 2012-02-27" we get Total records: 51675 (Total objects recorded: 73061). So basically 8000 detectorists would have found 244000 recordable artefacts according to the Heritage Action algorithm, but only 52000 of those finds generated a PAS record last year. That is each English and Welsh detectorist found and reported only 7.3 recordable items a year? The internet is full of videos of individual detectorists emptying out their finds pouches in the course of pulling out the collectables from the ground in the field that have found that many artefacts in (less than) a single day's detecting. Also have a look at some of the figures for self-recorders for that year. A figure of 59000 items juxtaposed with the HA algorithm shows that this is the equivalent of 1934 of Wilson's "ten thousand" (sic) being responsible and reporting to the PAS all of what recordable items they've found, rather than the odd rally find and thing taken to a club meeting. That's about twenty percent, isn't it Mr Wilson? So EIGHTY PERCENT of the detecting in the region English heritage is concerned with is done irresponsibly, ie totally clandestinely with no record being generated. Mr Wilson and his English Heritage mates really seem not to be in much of a position to challenge the Heritage Action algorithm if the best they can come up with is that there "might be" this, and "we might be talking" that. Pathetic. Bob Preece, 'Monumental cost to heritage as thieves and graffiti youths strike', Yorkshire Post, 25th February 2012. 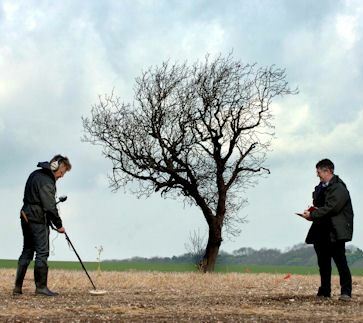 Focus on Metal Detecting: "Fourteen years' Liaison, Fourteen Million Quid But We get 26 Masters and Doctors out of it"
I was astounded at the comments of the English Heritage official on metal detecting as reported in Bob Preece's, Yorkshire Post article (see post above). So the archaeological record (the common heritage of us all) is annually robbed of hundreds of thousands of diagnostic and other artefacts, ruining - for the most part - any chance of properly understanding the sites they come from - the history of the landscapes which millions of people have the right to enjoy is ripped out - for the personal entertainment and profit of a few thousand individuals ("in partnership", nota bene with British archaeology - represented by the PAS). But "it is OK" saith the bloke from English Heritage because 26 archaeologists have been able to advance their career by getting their hands on some of the information (!) Well, is this not confirming EXACTLY what the collectors are accusing archaeologists of? They say that archaeologists are against no-questions-asked collecting because they see collectors as the "Competition" and the so-called "radical archaeologists" (ie preservationists) simply want to keep all the information to themselves. "Hang Preservation", says Pete Wilson here, "what is important is that we archies can get our hands on the goodies and some of information". No, no from the point of view of sustainable management of the archaeological record it is NOT what is important if it is done at the cost of gobbling up what is left of the archaeological record. Mr Wilson should bear in mind that archaeology does not exist as a public funded enterprise so a bunch of bearded jumper-wearing misfits (led by suit wearing jobsworths) can play scholars. How many of those 26 theses were ever published in a form that the general public (whose heritage is being robbed away as EH continues to ignore the artefact hunting problem) can directly benefit? What are the benefits to the WIDER public of having archaeological sites looted of collectables day and night, week after week? A PAS database of a few hundred thousand extracted artefact to gawp at? That's it? That is all British archaeology can offer for fourteen million jobs-for-the-boyz quid? So that "something like 26 PhD and Masters papers written based on material that has been found by detectorists" is supposed to justify in some way the plunder. "Science was done". Does the fact that we sent a man to the Moon on the basis of work done by the Nazis using slave labour on the V2 project in some way "justify" the concentration camps? Because "science" demands sacrifices? Werner Von Braun created weapons of Mass destruction that were fired at civilian targets in my country and knew full well what he was doing, but instead of being hauled up in front of the Nuremburg court, he was given US citizenship, a research team and labs and feted. What about using in modern research the results of Nazi medical experiments on concentration camp inmates? Does the aim excuse the means here too? Or WW2 Japanese experiments with poison gas on US prisoners? The AIA has a policy about using archaeological information from pillaged finds (and SAA); to the shame of British archaeology, none of its professional bodies has an equivalent policy. Yet Britain has a bigger problem with artefact hunters stripping sites all over the country for "interesting" collectable geegaws. British archaeologists just shrug and say if we cannot (be bothered to try to) beat them, then we might as well join them, and see what we can get from it for ourselves. Apparently 26 Masters and PhD theses 'for the boys' (I am sure PAS will correct me if the number is greater). At a cost of monumental proportions. Theft is theft, Isn't it? In Philadelphia, retired pharmaceutical company chemist 65-year-old Robert Franz of Plymouth Meeting pleaded guilty in November to conspiracy to defraud the United States and theft of government property for the theft of fossils from federal land in Alaska. He has now been sentenced to three years probation, a $100,000 fine and 300 hours of community service. It was determined that in June 2007 he had stolen a mammoth ivory tusk from public lands north of the Brooks Range and had also "conspired with others to make several trips to northern Alaska during the last few years to collect prehistoric and fossilized artifacts". Assistant U.S. Attorney Alicia Friend sought a sentence of 14 months in prison, calling Frantz an "artifact hunter" who used wealth estimated by prosecutors at more than $3 million to "gain access to protected lands, and then willfully pillage artifacts and natural resources." Defense attorney Richard Hark, however, said his client was an avid hiker who saw the tusk lying on the river bank on one of many trips to Alaska and found it "too good to pass up." He said Franz mailed the tusk to his home and put it in an armoire for personal enjoyment, not for profit. Which Attorney Hark presumably considers makes stealing such things all the less morally irresponsible I guess. to pass a number of statutory amendments relating to the holding of artefacts by museums. The changes, which were proposed by the Board of Protection of Cultural and Natural Assets and first announced in the Official Gazette on Jan. 19, dictate that artifacts which are not being used by museums can be valued by a specially formed commission and sold. The controversial statutory section now dictates that items which have been brought to museums and have not been claimed by valid owners or put to use by the museums within the period of one year can be sold by the state to collectors following an evaluation process by a commission of experts. There are of course fears among archaeologists and conservation groups that unless proper safeguards are built into the system, it is possible that this will give rise to an ethos of cashing in on culturally and historically important artefacts by selling them to rich collectors, perhaps foreign, rather than investing resources in facilitating their preservation for the common good. Many fear such changes could mark the beginning of a mercenary consideration of archaeological finds whereby the financial value of artifacts is placed above their historical significance. The head of the İstanbul branch of the Archeological Association, Dr. Necmi Karul, told the Vatan daily in comments published on Feb. 18 that the changes undermine the most basic of archaeological principles, namely that any artifact from any period of history is part of a shared culture and should, thus, remain as such. The Ministry of Culture and Tourism has clarified in a press release that the changes would allow for a better management of museum collections, and rather than selling off antiquities for cash, priority will be given to opening new avenues for the exhibition in other institutes of artefacts which are not being put to use or valued. It will be interesting to see how Turkey puts such a scheme into action, and how many artefacts leaving Turkey with documentation of legal origins as officially deaccessioned objects will be stripped of them by the no-questions-asked antiquities market in subsequent years. Zaman, 'Controversy over price-tagging of artifacts continues', Sunday's Zaman 22 February 2012. I write to you as the president of the Society for American Archaeology (SAA) to express concern about the new reality television show, “Diggers,” which will premiere on the National Geographic Channel on February 28. We ask in the strongest possible terms that you take steps to alter the message of the show, which, based on our review of the material on the program’s website, is contrary to the ethics of American archaeological practice, highly destructive, and possibly illegal. But the question the TV company are concerned with is merely 'is it good TV'? [...] the involvement of The National Geographic in this show is particularly troubling to SAA (as evidenced by the numerous letters of concern that we are receiving) because of the iconic position that your organization holds in our nation’s consciousness. The National Geographic is viewed as the national authority in many areas of scientific inquiry, interpretation, and understanding of mankind’s shared heritage, including archaeology. It also plays a central role in public education regarding the importance of preserving the historical and archaeological record. Certainly the bru-ha-ha around this programme can only be good for viewer figures. I would say the task now for SAA and AIA is to turn this to a national debate about just what it is the Americans expect out of the historic heritage in the ground, and bodies like the AIA, SAA and NGS. Is the aim of US society as a whole today to actually get something from the heritage of the past something more than a source of a quick thrill, some vaguely-'cultural' multimedia edutainment, and a material commodity or two like any other to desire and acquire? Is the metal detecting reality show "Diggers" setting a trend or representing one? That seems to me to be a question the SAA should be asking itself. This is, too, a question for the UK's Portable Antiquities Scheme - which of course as usual is determined to remain on the margins of public debate on heritage and keeping well out of the discussion. A British couple arrested in Egypt on suspicion of trying to smuggle priceless artifacts out of the country will return home tonight after it emerged that the objects had in fact been purchased at a local tourist bazaar. Michael Newey, 65, and his wife Angela, 62, were stopped at Luxor International Airport by officials trying to clamp down on the burgeoning illegal trade in looted antiquities. According to international news agency reports the couple, who are believed to have lived in Egypt for the past nine years, were carrying 19 objects in their luggage.[...] The seized pieces are now being prepared to be transported to the Egyptian Museum in Cairo where they are due to be examined by a specialist committee. However it has emerged that the couple were released after it became clear that the objects were almost certainly cheap fakes purchased in the local market where convincing reproductions – often made in China – are openly on sale to tourists.[...] A spokesman for the Foreign Office in London said the couple were on their way home. “I can confirm the arrest of two British nationals at Luxor International Airport. They have been released and are travelling back to the UK,” he said. The arrests were announced by antiquities minister Dr Mohamed Ibrahim, and Hassan Rasmi, head of the central administration of ports. The photo accompanying the "Luxor Times" blog article is captioned "Captured (sic) +antiquities+at+Luxor+Airport+by+Luxor+Times.jpg", which seems to suggest it was taken at the airport by a Luxor Times reporter, but it seems in fact to be a stock photo created to illustrate the article. It shows 27+ artefacts not 19, the three lamps are not smashed, there is no pot with a face, no sixteenth century Bible. Where is this photo supposed to have come from? Certainly it does show - where the fuzzy details can be made out - some pretty obvious tourist fakes, as well as some items more ambiguous. Let us note that the items Mr and Mrs Newey are reported to have been trying to export included a "sixteenth century Bible" and (according to Nevine El-Aref) "Coptic manuscripts" - it remains to be seen if that is true, and if so, whether they too were fakes or whether they are subject to Egyptian export legislation. [A "sixteenth century English Bible" would be either bits of the Tyndale Bible, the Henrycian Great Bible or the Elizabethan Bishop's Bible of 1568, one wonders where copies of any of them would be knocking around in a Luxor secondhand bookshop- though there are lots of British ex-pats there, many of whom will have taken their libraries there]. Anyway the controversial pieces will soon be in the Egyptian Museum in Cairo and 28-January-robbery-survivor Tarek Al-Awady and his staff will be telling us what they are, let's hope. Let us also hope that Dr Mohamed Ibrahim takes a few moments from his busy schedule to examine these items at first hand too and reflect on whether the whole affair should not have been handled a little differently. Would Zahi Hawass have claimed a shabti with Isis on the front mentioned in a report on his desk as national cultural heritage? Source: Jonathan Brown, 'British couple released as priceless artifacts they were smuggling out of Egypt turn out to be cheap market fakes The Independent, February 27, 2012. The Association of International Antiquities Dealers (AIAD) is an "association of dealers in antiquities (including fine art, coins, metallic and ceramic objects) whose aim is to promote responsible antiquities dealing and to provide a support network and means of exchanging relevant information about fakes, forgeries, fraudulent misrepresentation and stolen goods with a view to identifying such items offered for sale and notifying the appropriate authorities". Is that so? So why is an AIAD dealer currently selling a whole bunch of Pa-Miw ("Wenneb") shabtis? Has any new information surfaced then about their legal export from Egypt since I wrote about them here and several reputable dealers removed them from their lists and sent them back to their "London" supplier? Is the London dealer now offering them regardless, and now claiming two separate provenances for two groups he dates separately that mysterious supplier? Vignette: Brett Hammond, AIAD Chairman. Egypt: Busted for Tourist Souvenirs? Egyptian security officials say they have thwarted an attempt by a British man and his wife to smuggle 19 artifacts out of the country. Police say the couple were stopped in Luxor International Airport on Sunday with pieces in their luggage ranging from Pharaonic statues and pottery to a Greco-Roman bronze coin. the captured pieces vary between ushabtis, faience, ushabtisi , ostraca, manuscripts including an English version of a Bible dated back to 16th century and various coins" [...] The objects include a pottery pot on 9cm with a human face depicted, 5 pottery and green faience ushabti with hieroglyphic inscriptions and depiction of Isis which are dated to late pharaonic times. The objects [...] fall under the antiquities law No. 117 for 1983 and the Bible is subject of culture property which is protected by law 114/1983. [...] Mr. Hassan Rasmi (Head of the central administration of ports) said that during the Committee examination of the seized artifacts, the wife did throw and broke 3 lanterns trying to destroy the objects and the police force managed to control her. Dr. Mohamed Ibrahim (Minister State of Antiquities) said that the objects were in acquisition of a British couple (Michael R. and Angela N.) who was trying to leave the country and that the objects will be transferred to the Egyptian Museum storerooms in the next few days under the supervision of a specialized committee. This raises the question of whether Minister Ibrahim has seen these "green faience ushabtis with hieroglyphic inscriptions and depiction of Isis". I wonder whether he'd like to see mine too, bought in the shop round the corner from the Luxor souk (cheaper there) - I think most people who have ever seen a shabti knows these are fantasy pieces of the most amazingly obvious and comical nature. Let me guess, the "lanterns" are pottery lamps with the face of Hathor on them? I never managed to get one of these as all the ones on offer in the souk (and in the Cairo Museum shop) were so poorly made that I'd not give them house room. These too, by the way are all fantasy pieces. Luxor Time Blog: "We demand an official apology". A few hours later than the original post, the Luxor Times Blog now presents another side to the story. Luxor Times editor had the opportunity to meet in person with the so-called “smugglers” who were RELEASED immediately by the pre-judge at Luxor court and a committee will be formed for further investigation on the objects from Cairo and question what the antiquity specialist at the airport said it was a Roman coin, it was in fact a Romanian coin according to the couple. The full story and details will be published soon in the printed version of Luxor Times but from now until then, we hope that the British respectful couple get an official apology from whoever is responsible for this drama as long as the objects are not genuine. Otherwise don’t expect any tourists to buy a souvenir from the local market for 5 pounds as it may fool someone who should have studied for many years to be a professional and think it is genuine. Kate Phizackerley also has a post on this today: 'Couple Released at Luxor Airport', "to the embarrassment of all concerned a couple arrested at Luxor airport have been released after it was realised that the items in their baggage were not antiquities but tourist trinkets. [...] One would think that with all the out of work archaeologists in Egypt one would be employed at Luxor airport so that these mix ups didn't happen". Nevine El-Aref however ('Cairo Airport authorities foil smuggling attempt', Monday 27 Feb 2012) reports that the arrest took place in Cairo, with the added details that the lamps "were decorated with winged amulets and the goddess Isis", the term ostraca is explained as "inscribed stone reliefs" (summat else surely?). She also says "coinS" were involved and "Coptic manuscripts". The smashing of these items by the owner once the customs had opened the cases is difficult to explain if they were tourist copies. These "winged amulets" were not winged phalli by any chance were they? Well, we look forward indeed to the full story of what these objects turn out to be. One wonders why the British couple were travelling with a Romanian coin in their luggage? * Buying the 16th century Bible and Coptic manuscripts (if old) there though was a bad idea. How many times is that this last year that an "antiquities retrieval" story from Egypt turns out to have concerned fakes (or probably would if the Egyptians would have produced follow-up stories admitting it)? * There is an explanation actually, little kids make some money by asking tourists for small "coins", and in return for a flashing smile of gratitude get low-value small change in various currencies, which they then hawk around to other tourists asking them to "change the money". Obviously an Egyptian kid cannot buy bread in the local shop for Romanian coins, and some kind hearted tourist may give them an Egyptian pound or two for the worthless modern coins if the kids look appealing (or desperate) enough. No harm done. Photo: A small part of the Barford Family Collection of ridiculous and not so ridiculous tourist fakes. The second from the right (bought in Luxor in 2010) is the Isis-fantasy type. The fabric 'behind' is part of the new line of excavation fashion wear I am thinking of marketing, these are exclusively fatigued Luxor 'tomb-crawler' jeans. Rather than ineffectual import restrictions and inane blogs it seems to me the best solution is rather quite simple: Have those countries ban metal detecting. Why not embrace the authoritarian approach and create a solution matching the philosophy of the state. After the first few detectorists are shot looting will quickly cease. and the ACCG have the nerve to call Preservationists "radical". Potts want to educate the Darkies, Lueke wants to see them being shot if caught with a spade in their hands. We want market country collectors to stop buying stolen artefacts and blood antiquities. There seems a disturbing subcurrent of violence in US coin collecting, Dealer Dave wanted to see State Department officials hung by the mob "strung up from the lampposts along Constitution Avenue" (he has since deleted that post), Lueke wants to see authoritarian regimes executing artefact hunters, collector Pastor Scott has a big gun and 'shoots to kill' and (if home at the time) will blow out the brains of anyone who comes near his accumulation of ancient coins. And, "inane" a collector may consider blogging on the issues to be, but all we want to see is market country collectors stop buying stolen artefacts and blood antiquities. See also: Potts: "We have to support better policing of the sites", says the new Getty Museum Director. What does he have in mind? 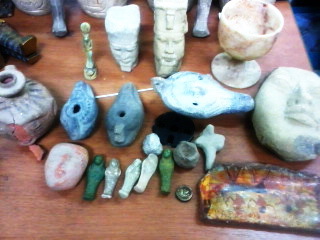 Illicit South American Antiquities being sold on ebay...to support Oxfam? "A part of the proceeds from this auction will be donated to Oxfam America and funds will go toward helping the people suffering in East Africa. Please check out my other auctions for quality Ancient art." You have got to be kidding me! But, yes, it is true. Note the official Oxfam "Ebay giving" deal at the top. So there you have it, for Oxfam to help "people suffering in East Africa" one has to try and forget the terribleness of the antiquities trade in South America, especially in relation to poor and Indigenous communities. For an organization that has a primary goal of finding lasting solutions to poverty-related injustice, they appear to be supporting poverty-related injustice in South America. Oxfam's brand is right there ON an illegal online antiquity sale. Here is their contact info. They probably have no idea that this is going on, but if they are going to launch campaigns like this one through ebay they need to be more careful about where their money is coming from. The same goes for any kind of commercial artefact hunting "for charity". Of course the middlemen who purchased the antiquities from the diggers and the smugglers who then sold them on already have their money, and I think it is a fair bet that very little of that went to poverty relief. I expect its a very lucrative business. Despite being Senior Countryside Officer at Sandwell MBC (Walsall, UK), metal detectorist John Stokes apparently does not really understand much about archaeological conservation. So much so that he wrote to English Nature about their environmental conservation schemes, in fact he submitted it as a FOI request. Dear Natural England, As a local authority countryside officer and metal detectorist I was slightly puzzled by a clause in the environmental stewardship agreement banning the above. English Nature, as I understand it after 27 years as a senior officer in countryside management, exists to protect and improve habitats. Can you please explain why it is felt necessary to include any reference to metal detecting and archaeology in agreements, as it seems to me that both activities are out of your remit and terms of reference. Yours faithfully, John Stokes, countryside officer. I find it pretty astounding that somebody who has (it says) a senior post of this nature denies the importance of the conservation of the historic record (the resource artefact hunters are looting) in sustainable landscape and environmental management - which is what English Nature does. How can one conserve one element of the environment without caring for another? Surely environmental conservation is holistic and not exclusive? Perhaps it isn't in Walsall. No matter, English Nature treated that question with the disdain it deserved. The Rural Development Programme for England (2007-2013), [...] identifies the protection and enhancement of landscape and the historic environment as one of the 5 key objectives of Environmental Stewardship. The schemes provide incentives to carry out land management to protect and enhance historic environment features, habitats and species, landscape, soil and water resources, and access to the countryside. Natural England [...] along with English Heritage, has an Action Plan to deliver the UK Government’s response to the European Landscape Convention. This places value on the cultural aspects of landscapes, including the historic environment. Natural England consequently has a remit for the historic environment in all its activities. One would have thought that a "Senior countryside Officer" would have known about the RDP and the European Landscape Convention and the government's response to it. Perhaps not in Walsall. One would of course have expected nothing less. This means, if these rules are adhered to, that there should be a clear concentration of reported archaeological finds on Environmental Stewardship (ES) land. Sadly there appears to be no obligation on a landowner receiving ES subsidies to ensure that metal detectorists using this land as a source of collectables are complying with this requirement - for example verifying all finds are reported on the PAS database, or even incorporating in their land access agreement with artefact hunters the requirement to report ALL finds under penalty of revoking permission, still less the placing of such agreements on file with the administrators of ES conservation funds. The next bit of Historic Environment Senior Specialist Jez Bretherton's text however raises eyebrows. I'll discuss it in the text below. Metal detecting is not banned on land under an Environmental Stewardship (ES) Scheme, it is facilitated in appropriate circumstances. One wonders what the "appropriate circumstances" there might be for the recreational destruction of archaeological evidence. What are they and do they apply only in rural England, or can one generalise and create guidelines for the stripping of collectable artefacts from sites in Iraq, or maybe the sands of the Sahara Desert (see here also), or the ancient sites of the Four Corners region of the USA? clarifies the person with the ES Agreement must ensure that no damage is caused to (known environmental) features, and any additional features of which you are subsequently advised in writing by Natural England, wherever metal detecting takes place. What it does not say is that when clusters of archaeological artefacts removed from ES Agreement land for collection or sale by artefact hunters start to appear in the records of the PAS, that there is any mechanism whatsoever that leads to their assessment as (now) known archaeological suites and whether their preservation is desirable. It basically looks as if in typical british-muddling-through manner, a half-baked system has been set up which would make sites 'known' but in fact nobody gets to know about them or stop their depredation under the ES Agreement which should be protecting them. Now, why is that? is taken to mean disturbance of previously undisturbed deposits in and on archaeological sites and monuments, and any removal, loss and/or disruption of standing masonry or other upstanding structural material. The bit about "any removal, loss and/or disruption of standing masonry or other upstanding structural material" on an archaeological site is a bit of a no-brainer, but wholly unclear is the nature of surface evidence. What English Nature are saying is the equivalent to saying that a copse of 100-year old beech trees is damaged, not when eight out of ten of the trees are cut down and carted away for firewood, but only if the roots are dug out. In the case of the English landscape (as across most of lowland Europe) many sites are represented only or mainly by the patterns of artefacts and other material resulting from or modified by human activity in the past in the topsoil layers. The study of landscape use in the past consists to a large degree in many landscapes in the study of those patterns, with only limited sampling by excavation. These are techniques that have been developing since the 1960s/1970s with a huge literature going back many decades and yet wholly ignored by English Nature definition of "archaeological site" and its definition of "damage to archaeological sites". English Heritage's policy document "Our Portable Past" is one of the places where policy is laid down how these types of sites are to be examined and treated, one would have thought that in the case of sites which lie on land the conservation of which is supposed to be assured by English Nature-administered environmental schemes, such a manner of data-gathering would be the minimum required. It should be pointed out that this definition of "previously undisturbed deposits in and on archaeological sites and monuments" is not precise enough to be used. For example a site may consist of active modern ploughsoil overlying a fossil ploughsoil (for example accumulated at the base of a slope or on a lynchet) which is also "previously disturbed" (how "previous" is "previous"?). By definition, most of the layers forming an archaeological site are "disturbed", they've been put there by human or natural agencies on top of the undisturbed geological substrate. The plot of metal finds (versus cropmarks) at Cottam from the VASLE project is a clear illustration that the distribution of material in ploughsoil is not random, but contains several levels of archaeological information which can only be interpreted properly when the data are collected systematically and properly. Removing these artefacts from the topsoil without following that data gathering procedures destroys for ever not only the information content of the removed artefacts, but our ability to interpret the site itself from which they were taken. Like somebody stealing the murder weapon and other 'souvenirs' from a crime scene before the cops' forensic team arrives. Damage IS done to the archaeological record by the improper removal of items from patterned asemblages in the topsoil and ploughsoil. It is a shame that English Nature does not know it, or acknowledge it. Scandal. "i can now get 24″ on the same small coins as i know the machine inside out and a lot lot deeper on the larger finds..."
Twenty-four inches is 61cm, well below normal ploughing depths on most soils, so using one of these 'site wrecker' machines on Environment Scheme lands will mean the artefact hunter indiscriminately hoiking out stuff potentially from those "previously undisturbed" layers. Minelab, readers will remember, has recently given 41000 dollars to a US pressure group lobbying to have existing or intended restrictions on where these machines can be used lifted. Italian Archaeologist Turns Dodgy Dealer? I am an Archaeoblogger, What do I do? "Didn't See That Bit" coiney "scholarship"
WW2 Museum Damaged in Greek Rioting? V-Coins: Buying a Pig in a Poke? Metal Detectors for Sale, Legal and Undocumented. Lueke Lances Lanze: "Wie es ist in Yuropa"
"The work of the ACCG"